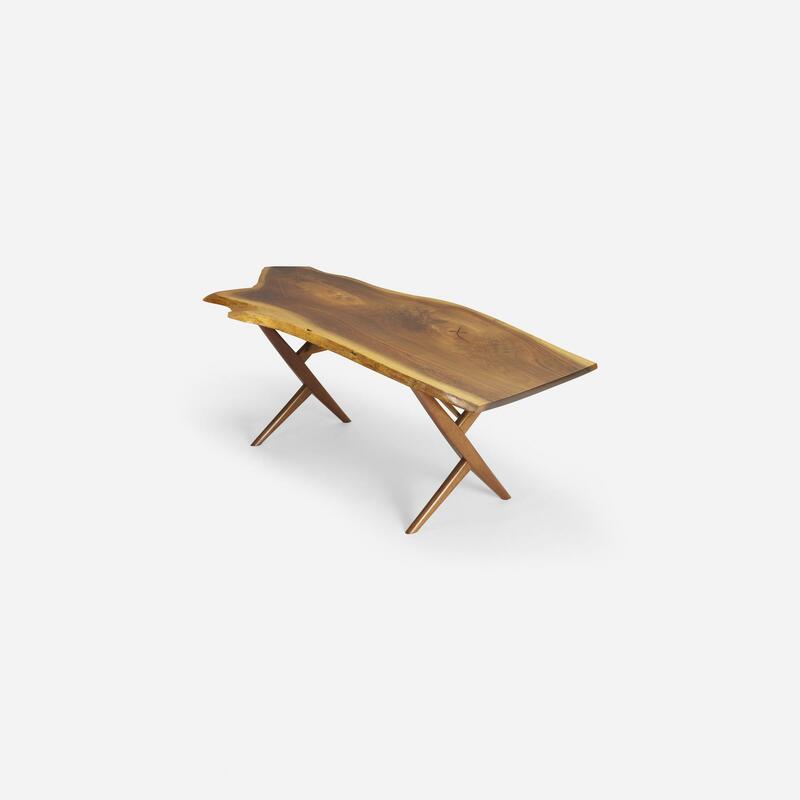 Born in 1905 in Spokane, Washington, to Japanese immigrants, George Nakashima is an American woodworker and architect, who was a leading figure of the American craft movement and innovative 20th century furniture design. 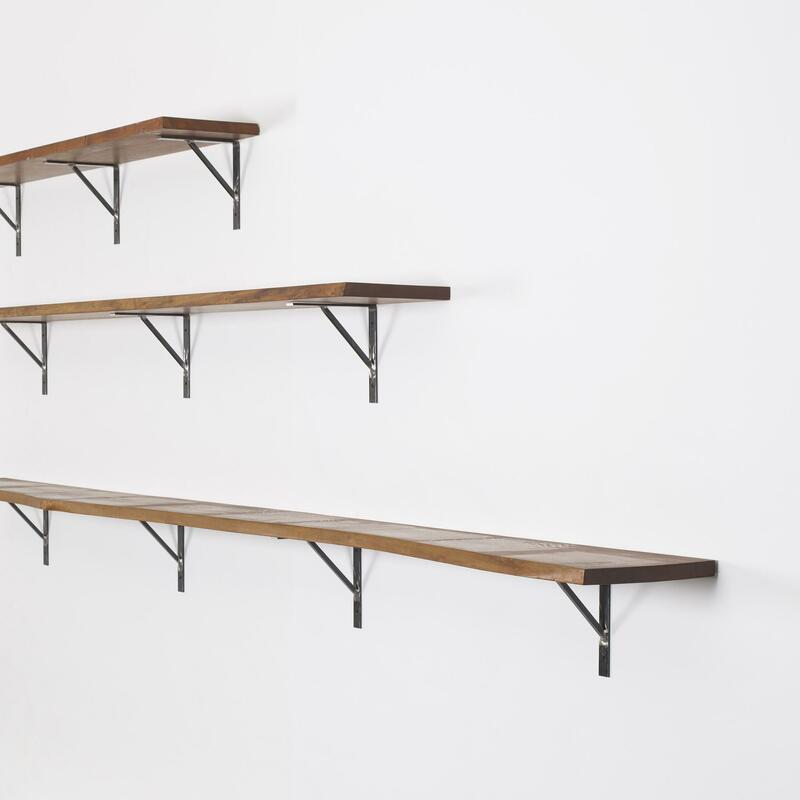 He was educated in architecture at the University of Washington and M.I.T. 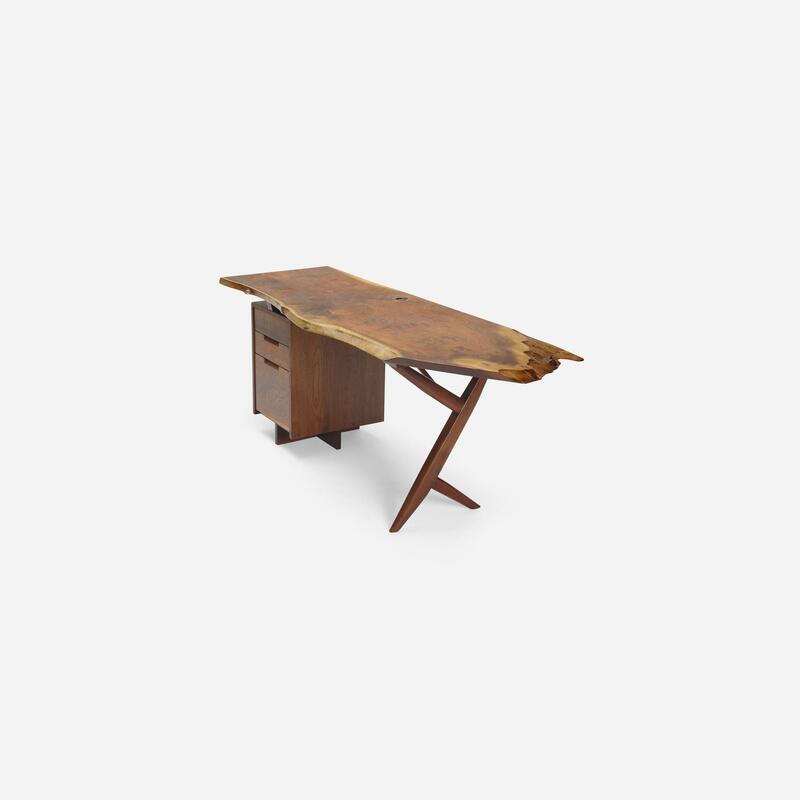 After finishing his studies in 1931, Nakashima sold his car and bought an around-the-world steamship ticket. 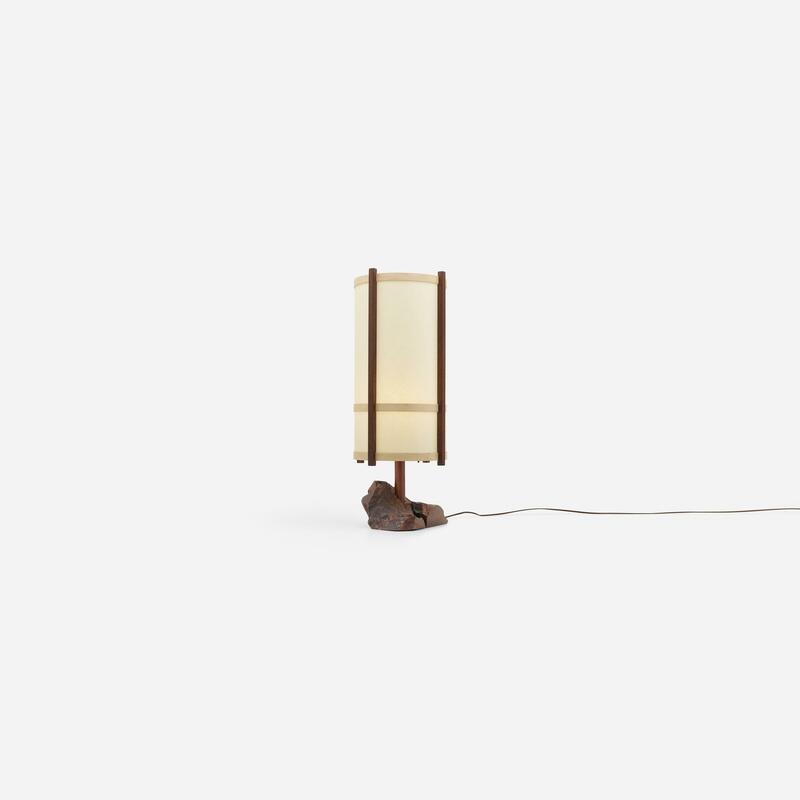 He traveled around in France, living the bohemian life in Paris for a year, India and Japan. 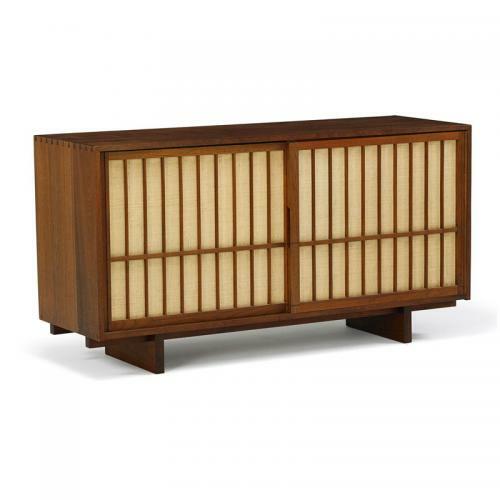 In Japan, while working for Antonin Raymond -American architect who also collaborated with Frank Lloyd Wright-, Nakashima journeyed through Japan in detail, learning Japanese architecture and designs. 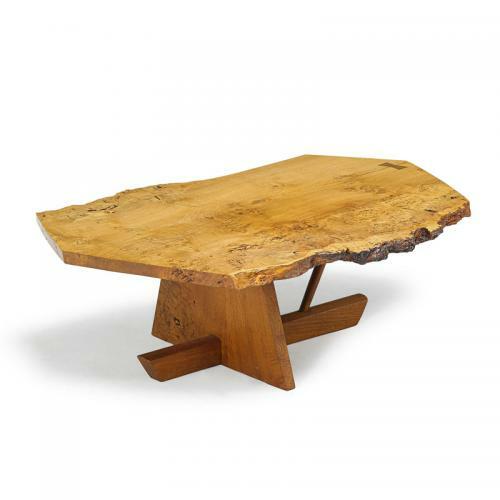 Throughout his travels, Nakashima absorbed both traditional and modern aspects of art, design and culture and melded them in his unique style. 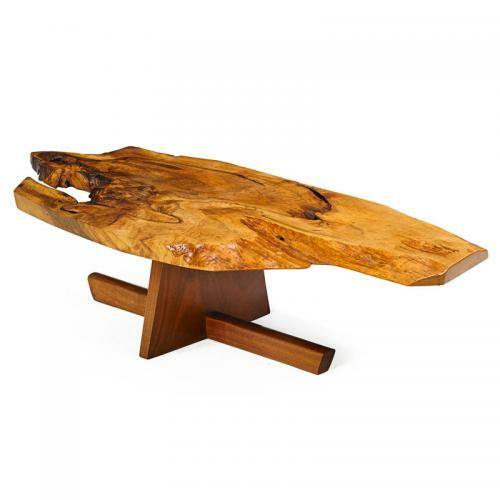 Interested in selling a work by George Nakashima? 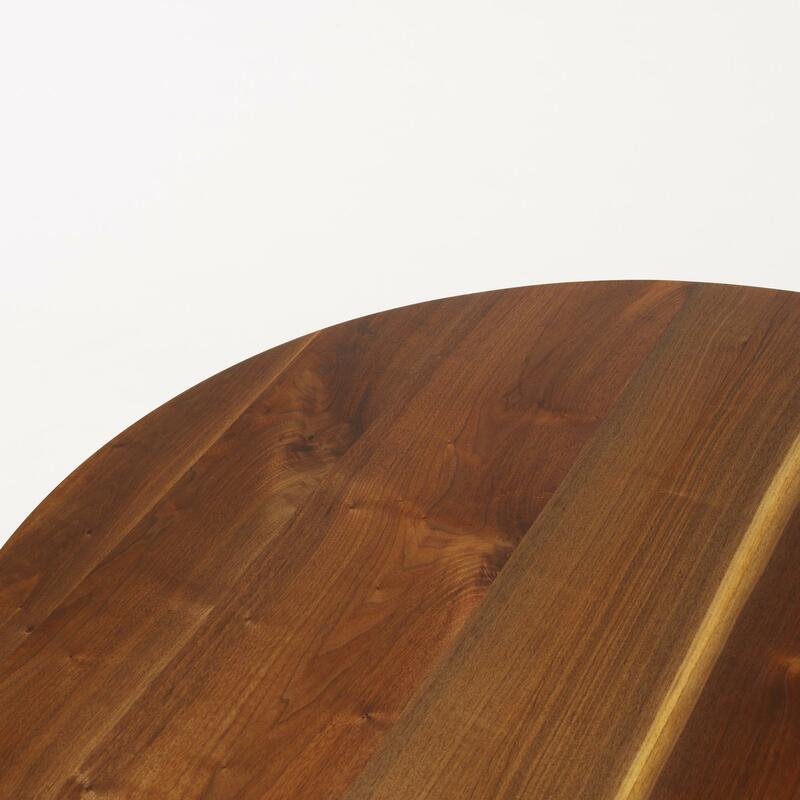 However, the turning point of his career came in a film-like moment. 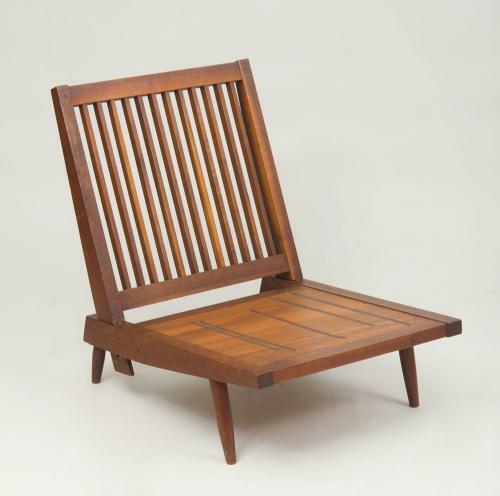 During the WWII, like many Asian Americans, Nakashima was exiled into an Internment Camp. 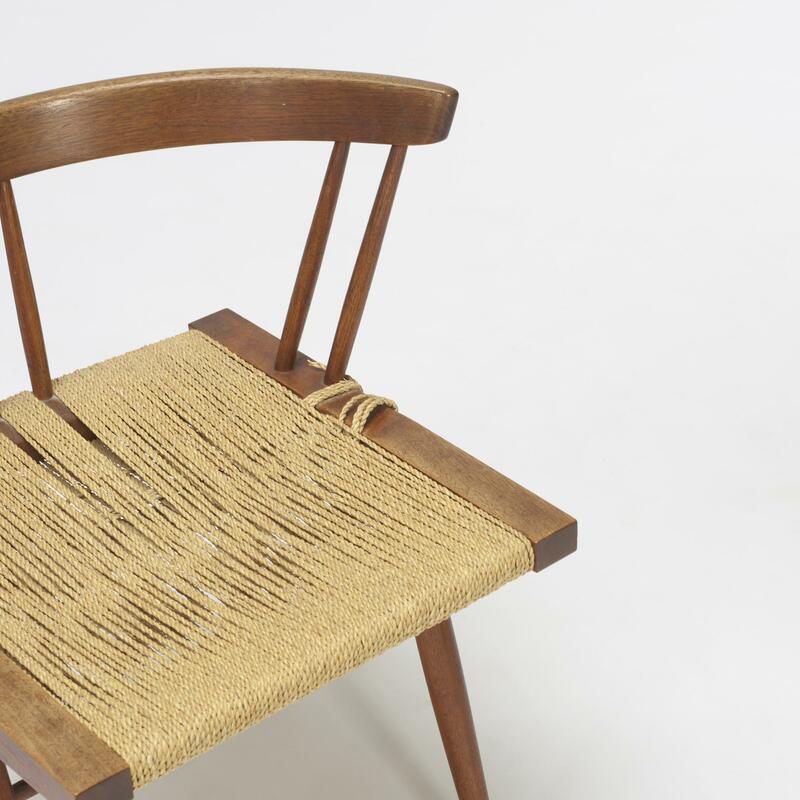 Here, he met an old master of traditional Japanese carpentry and under his teaching, learned the secrets of traditional Japanese hand tools and joinery techniques. 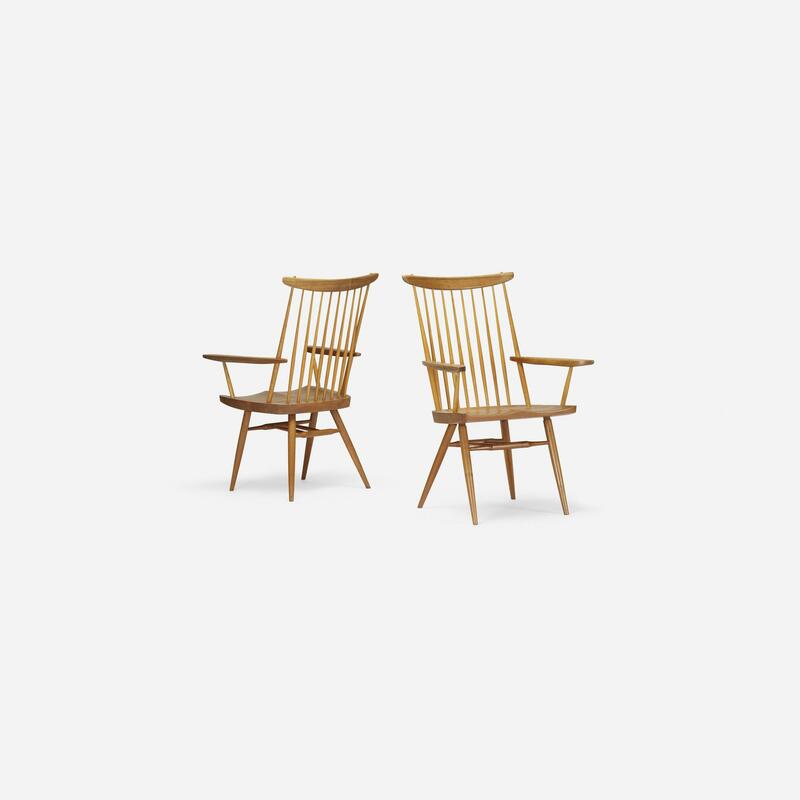 More importantly, he learned to approach the wood with discipline and patience, understanding it better and seeking perfection in each phase of his design. 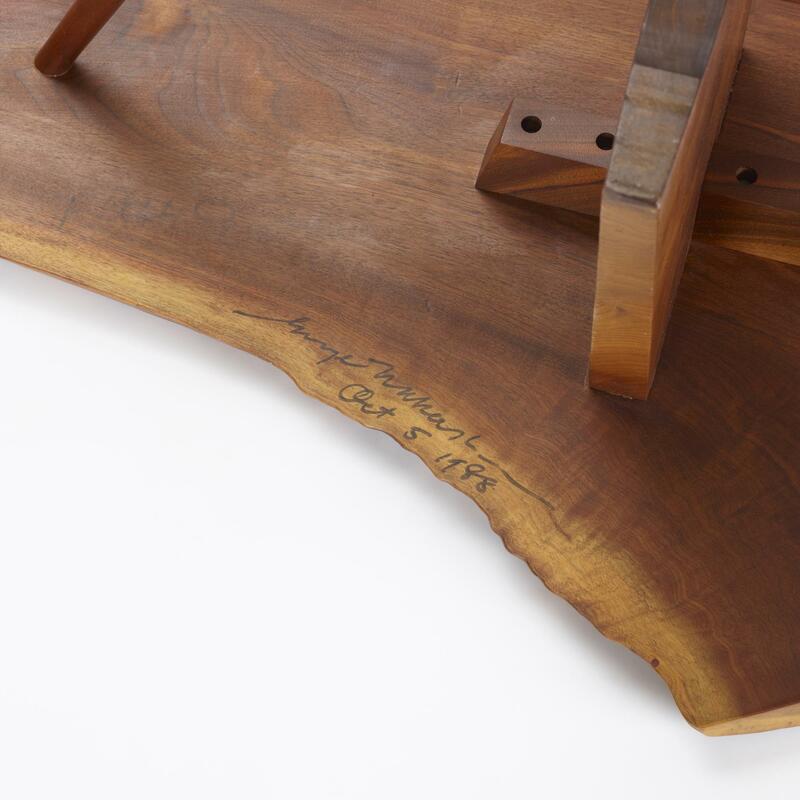 Nakashima had a special relationship with wood and the tree itself, visible in his memoir “The Soul of a Tree”. 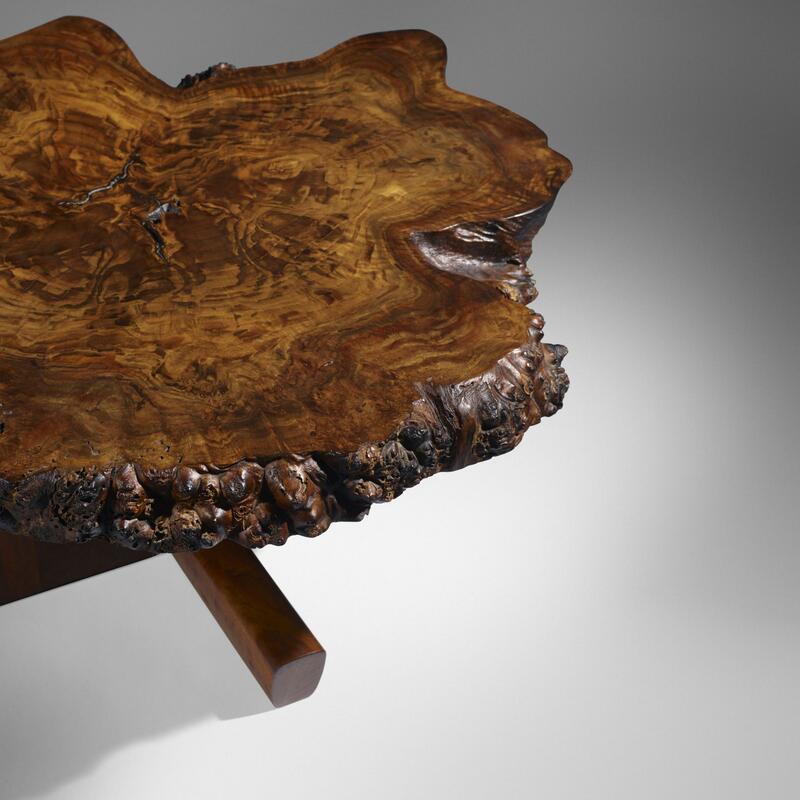 He gave a second life to the trees with his signature woodworking design, using massive solid wood slabs with unfinished natural edges or multiple slabs connected with butterfly joints. 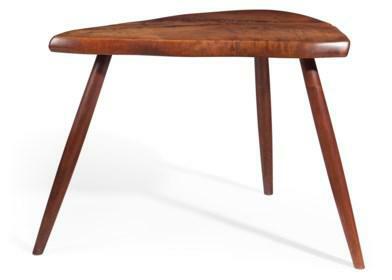 He is known for his preference of walnut, ash and cherry and accepting materials that were rejected by other woodworkers for their imperfections. 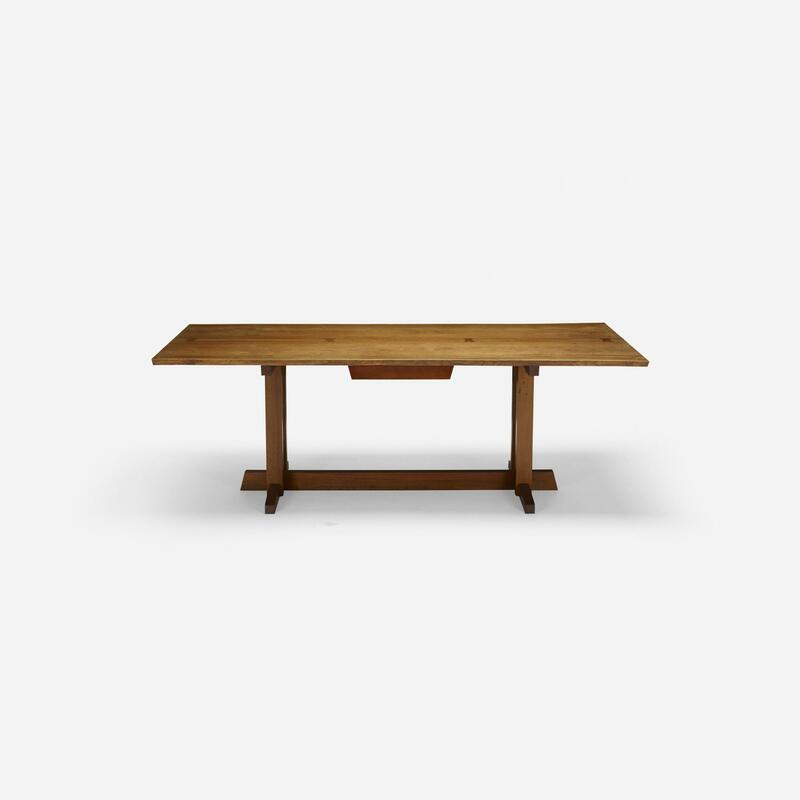 Nakashima always included family members in his studio, most importantly his Harvard educated architect daughter Mira Nakashima, who took over his legacy. 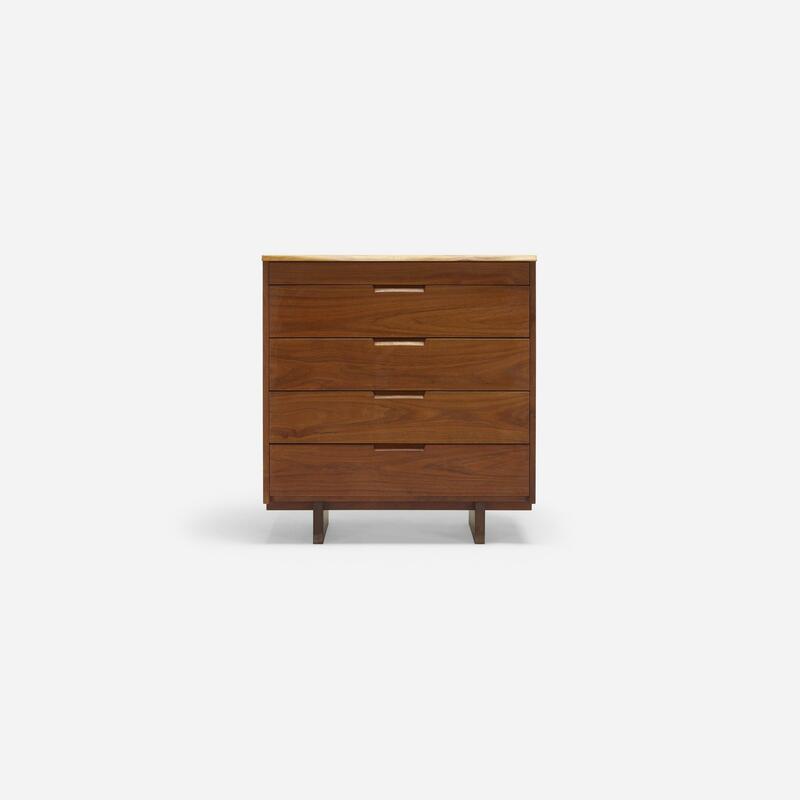 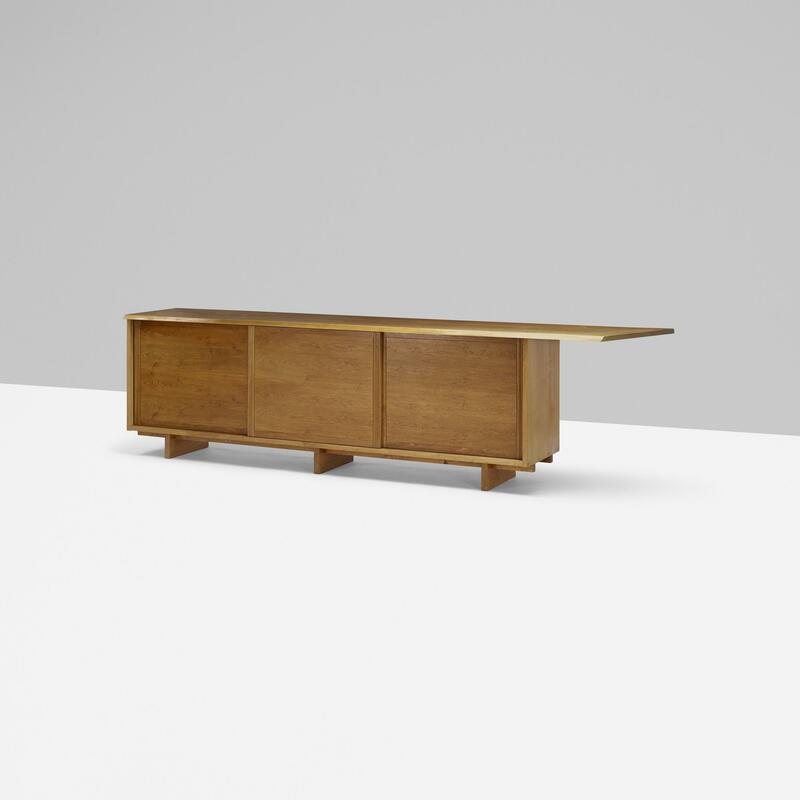 Today, Nakashima furniture is favored by both the collections of traditional institutions such as the Metropolitan Museum of Art, Smithsonian Institution and Philadelphia Museum of Art, as well as in the homes of Stephen Spielberg, Brad Pitt, Diane von Furstenberg and Steve Jobs. 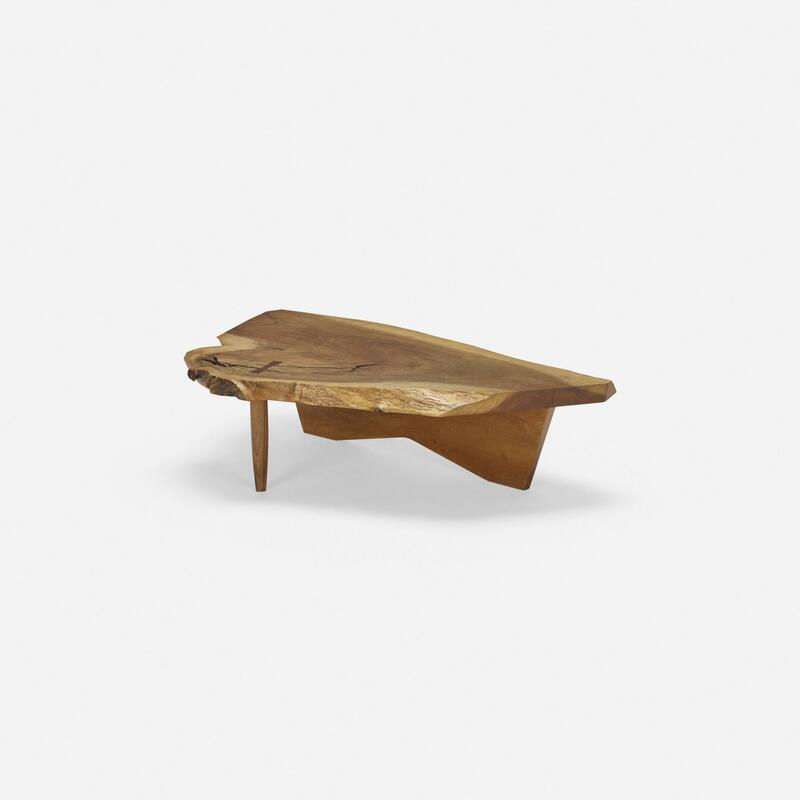 What is George Nakashima known for? 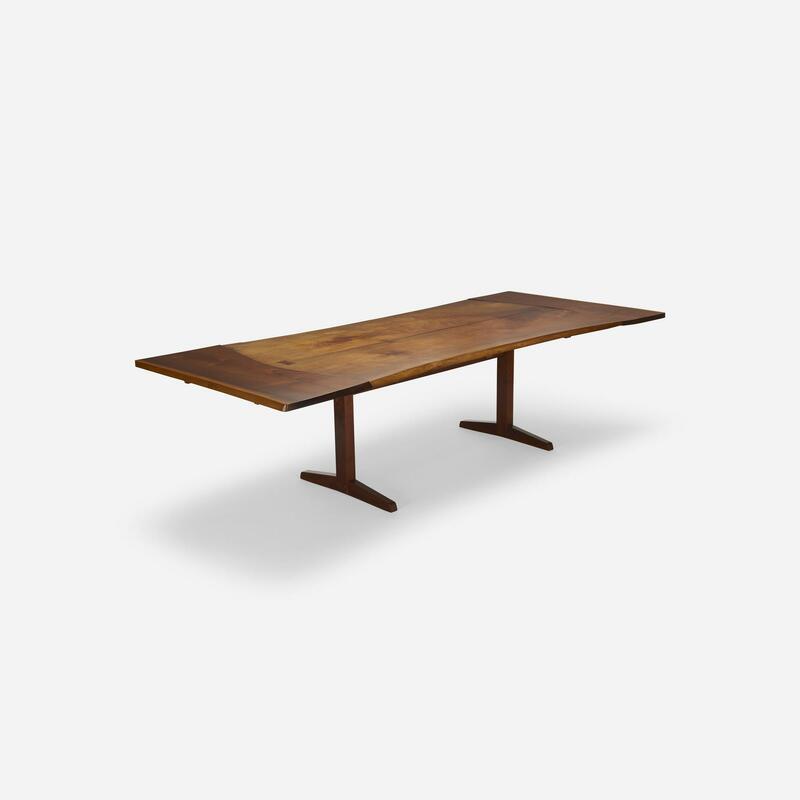 Two of the most memorable pieces designed by George Nakashima are the Straight-Backed Chair for Knoll and the Widdicomb-Mueller Dining Table. 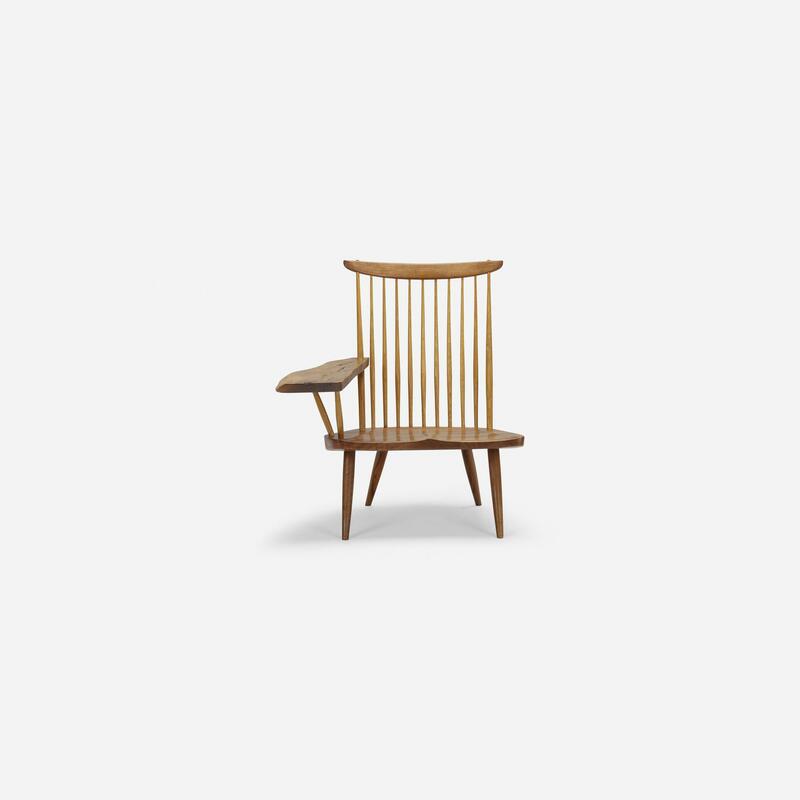 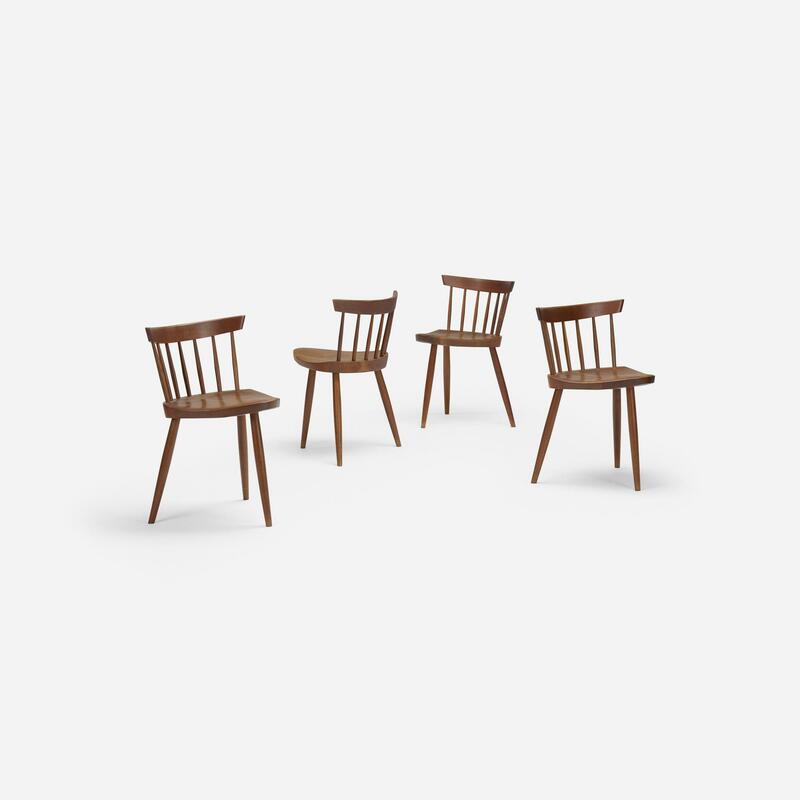 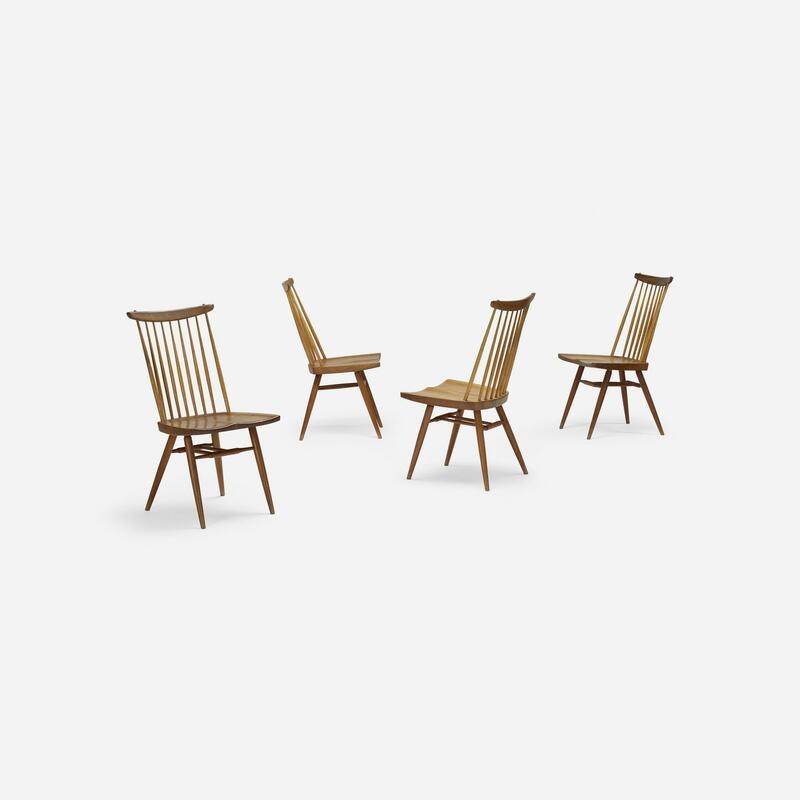 Known for creating everyday functional objects instead of furniture with elaborate designs, Nakashima’s Straight-Backed Chair of 1946, which has unmistakable craftsmanship and sculptural lines, has inspired a lot of new designers. 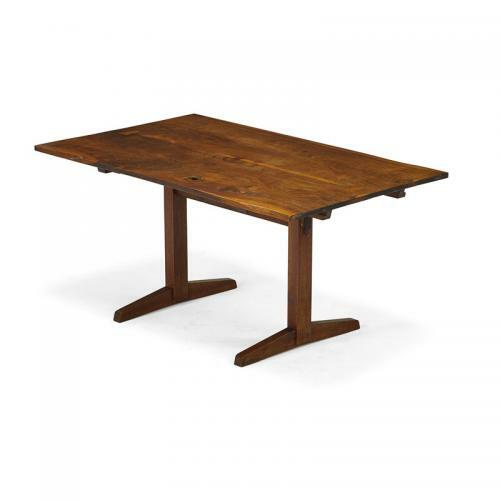 The Widdicomb-Mueller Dining Table is an extension dining table made out of his signature rare timbers. 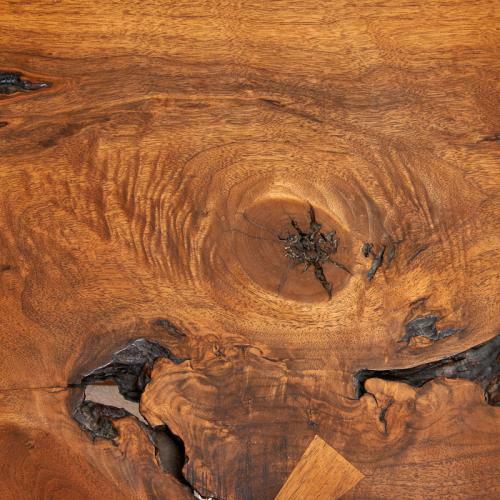 He used highly figured walnut, rosewood, laurel and Carpathian Elm timbers to build it. 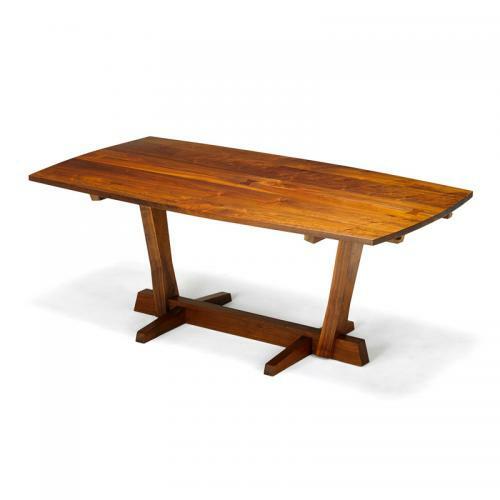 This table looks distinct because of its six tapered hexagonal legs and stretchers. 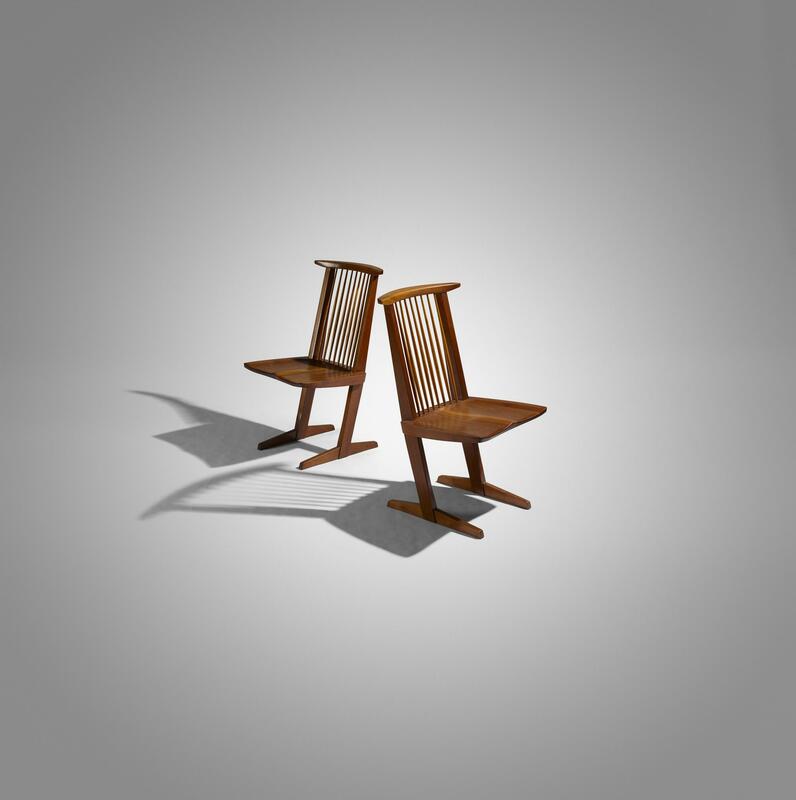 What auction houses (and galleries) have sold George Nakashima items? 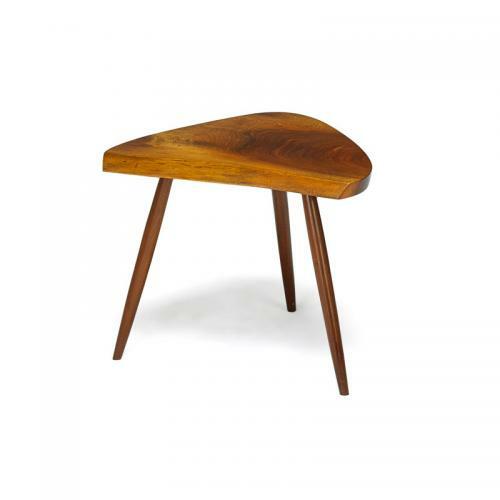 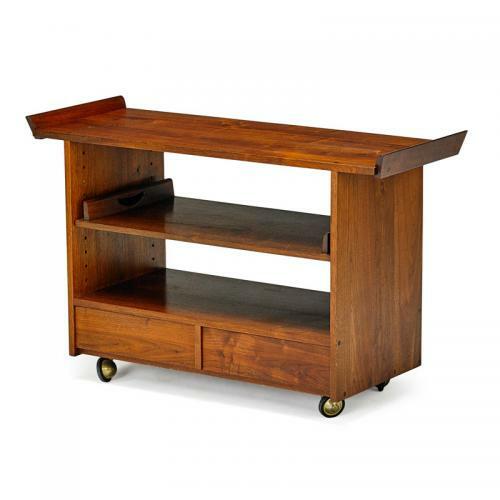 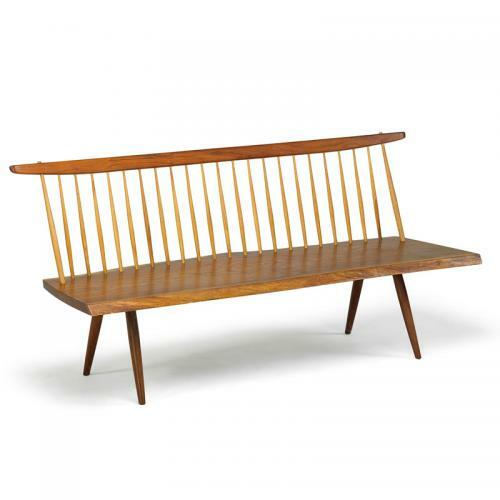 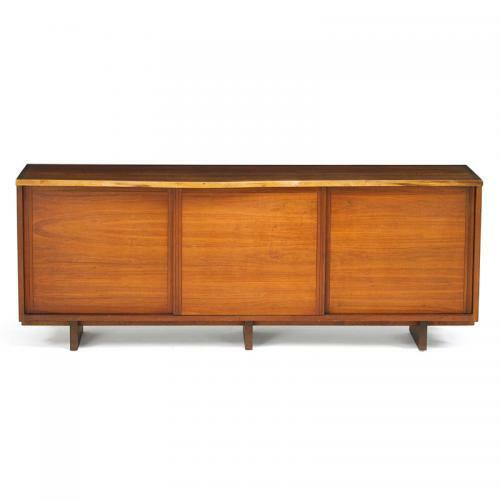 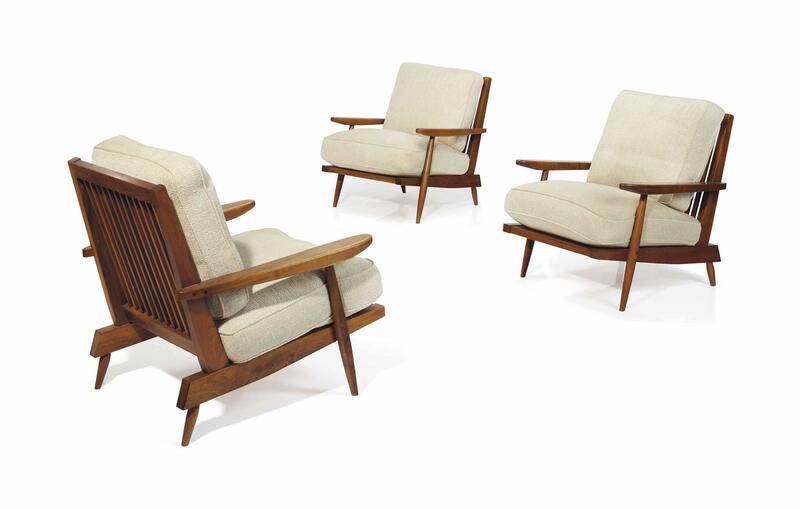 George Nakashima’s furniture pieces are very popular among art and antique collectors. 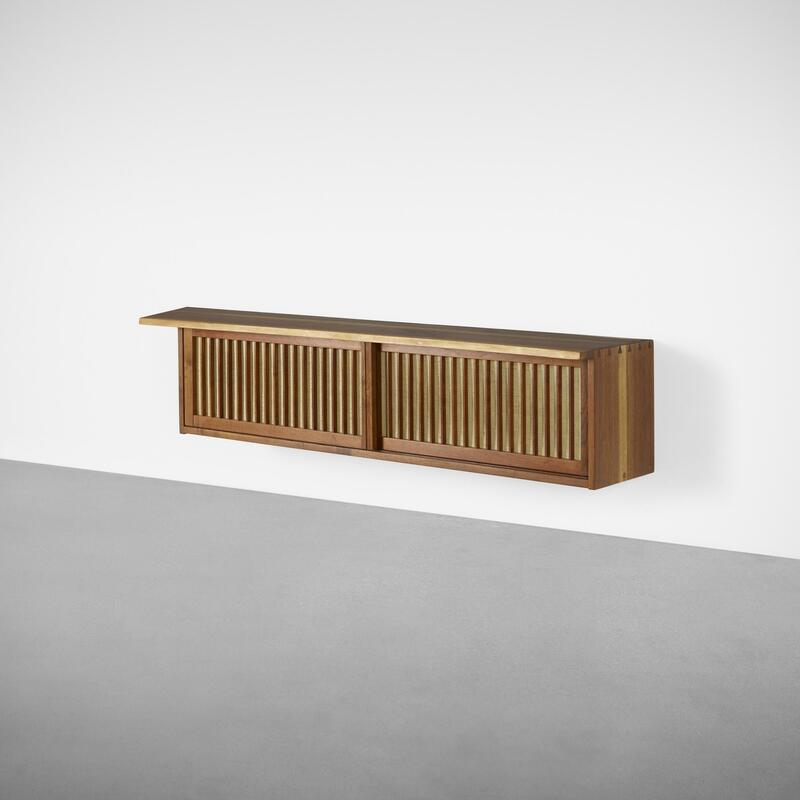 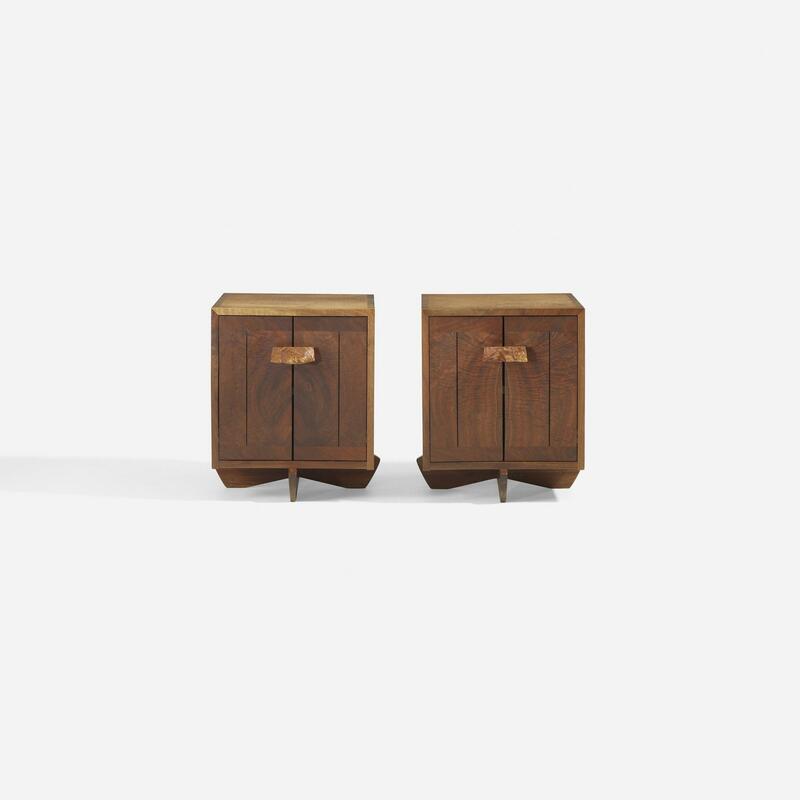 Some of his works, namely the Minguren II Low Table and the Walnut Hanging Cabinet, were on display at the Todd Merrill Studio in New York and the Hemisphere Gallery in London, respectively. 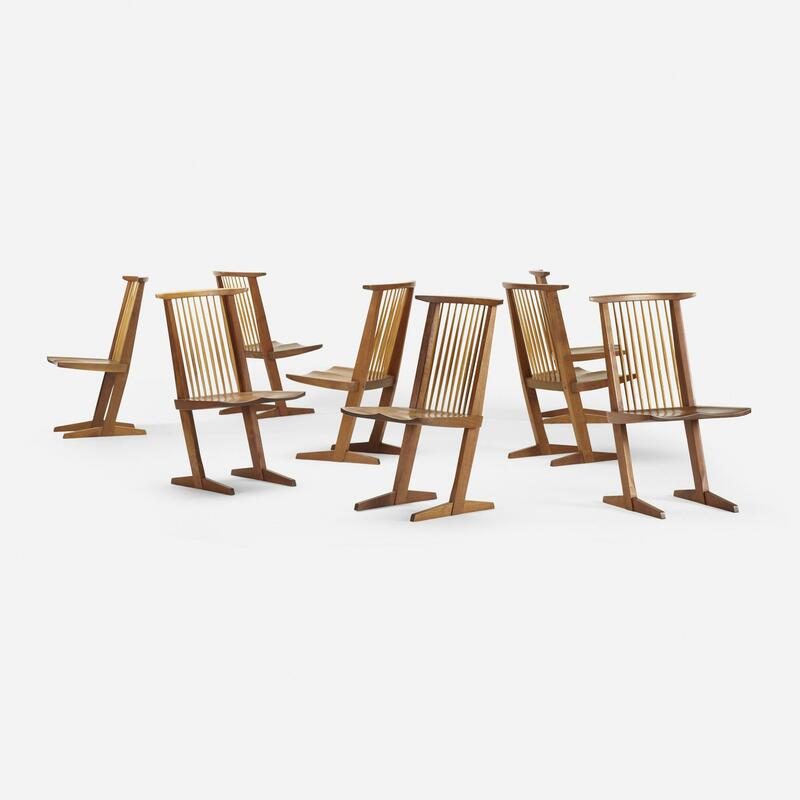 Auction houses have a few lots of his famous pieces as well. 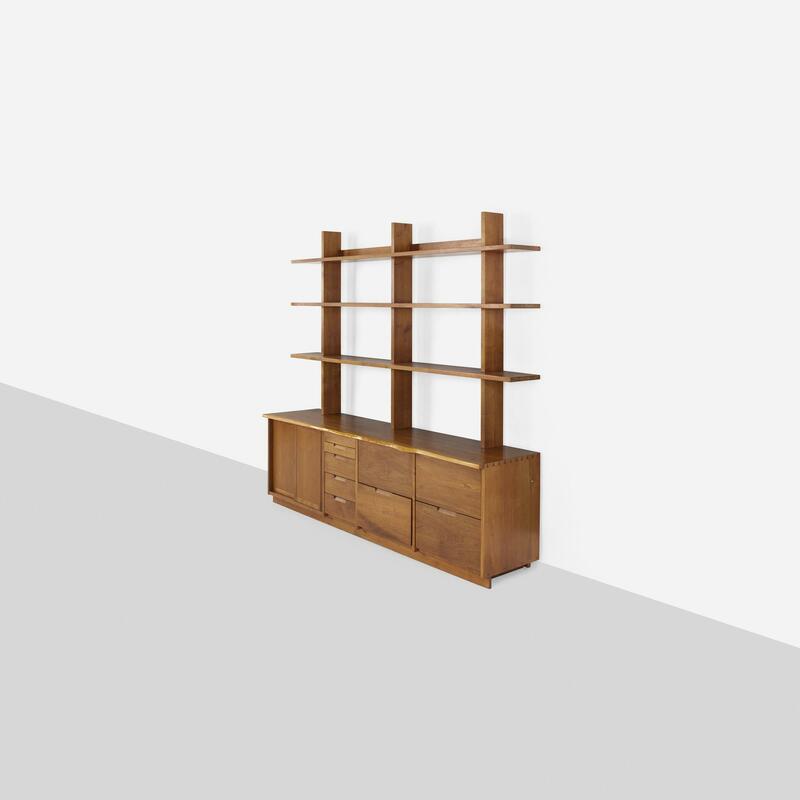 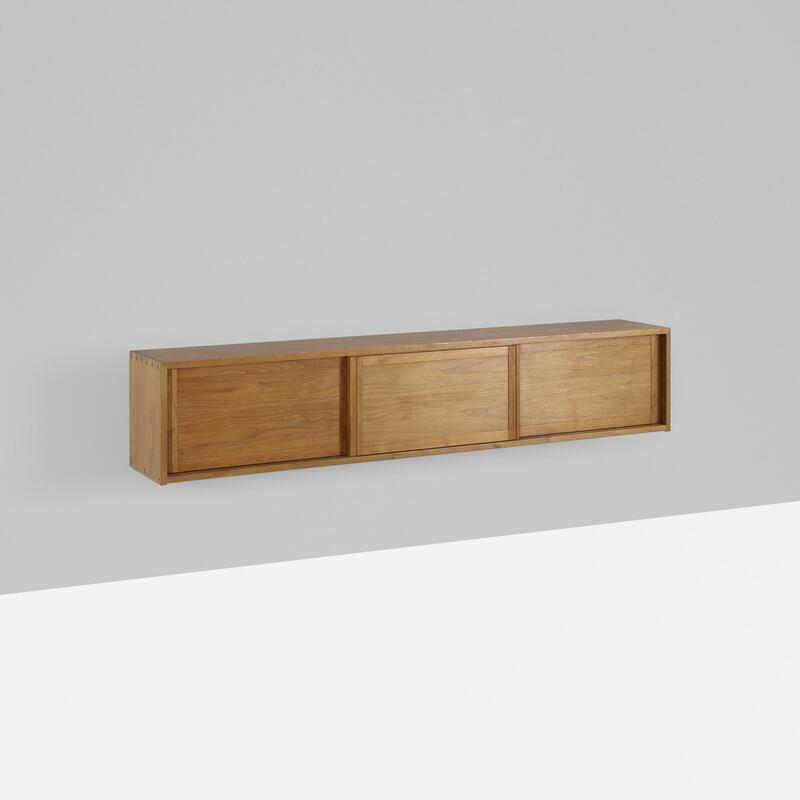 Wright auctions Nakashima’s 1972 Rare Cabinet while Christie’s has sold some of his pieces which were named A Wall Cabinet, A Walnut Console, and An Important Long Chair. 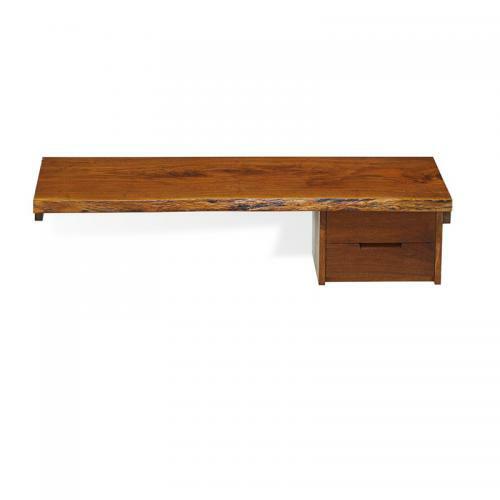 What is the price range of George Nakashima items? 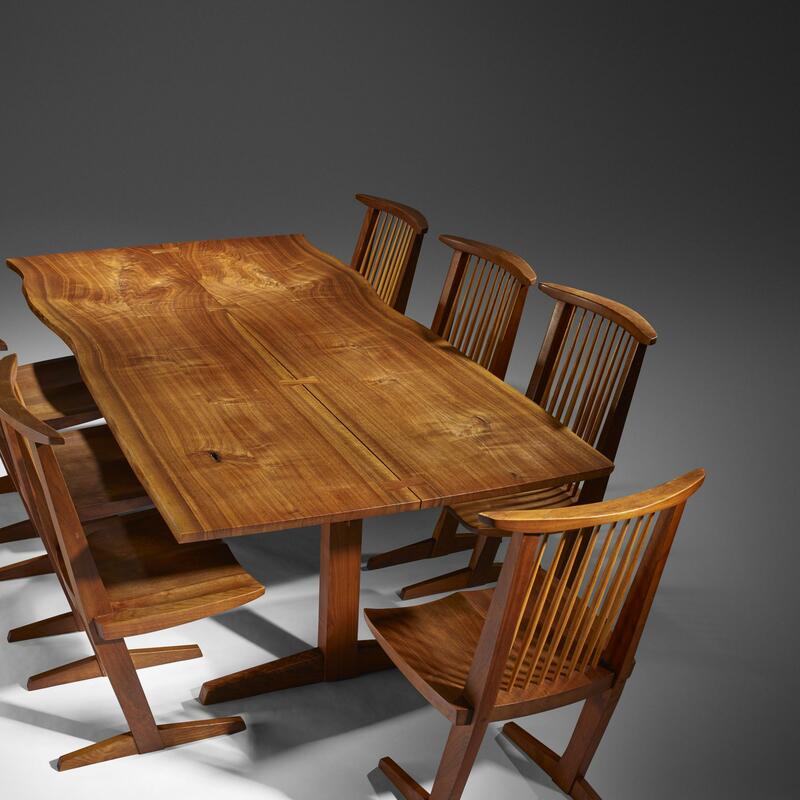 George Nakashima’s designs are highly regarded by critics and collectors. 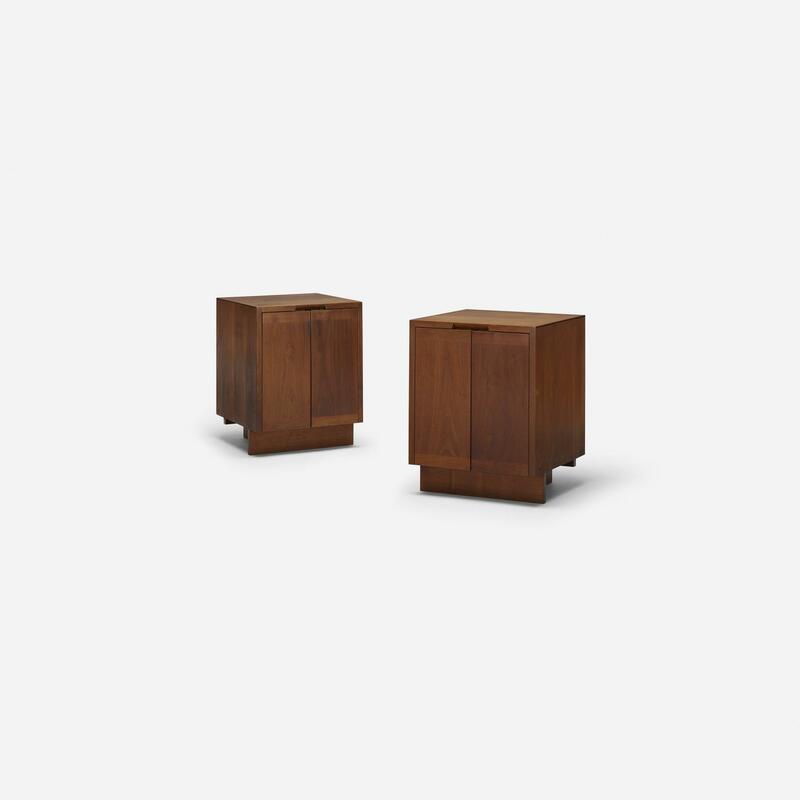 Whenever his pieces come out at an auction, it commands a price of anywhere from $25,000 to $300,000. 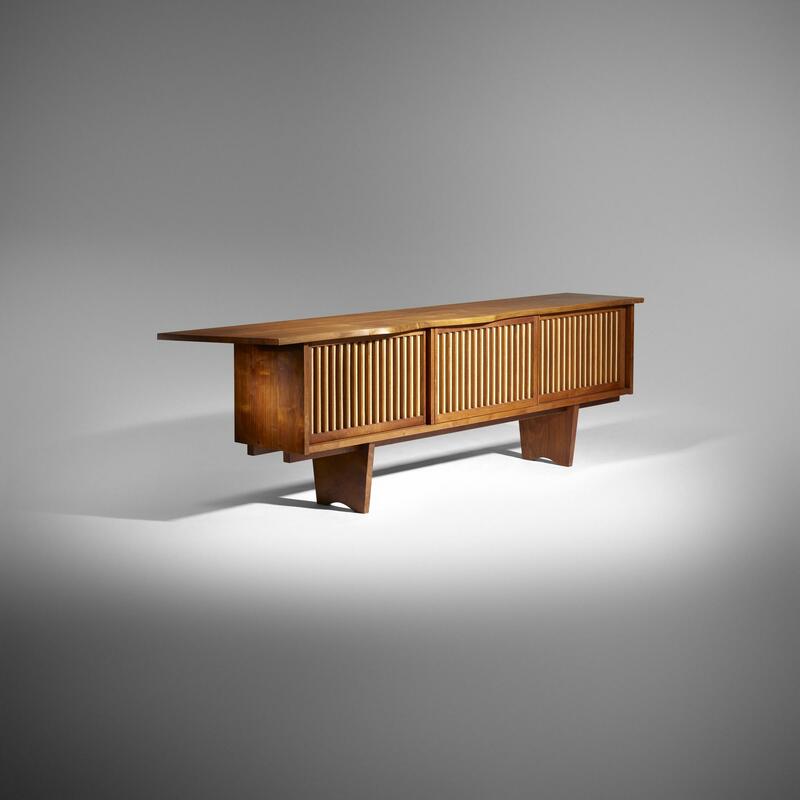 The most expensive Nakashima furniture auctioned by Christie’s was the 1978 A Coffee Table, which was sold for $149,000. 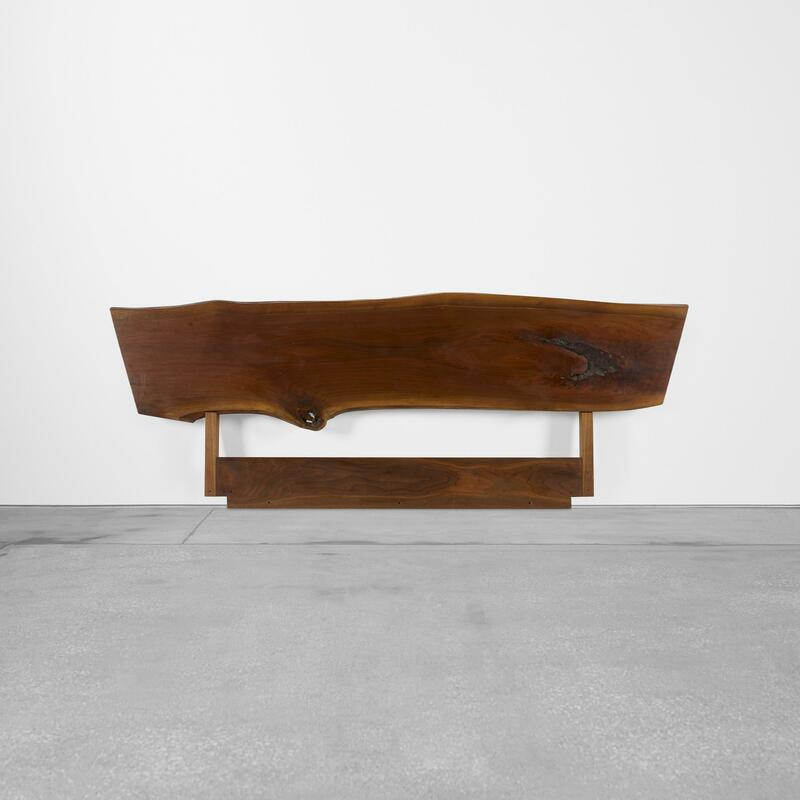 His works has reached auction houses around the world, particularly in Seoul and United Kingdom. 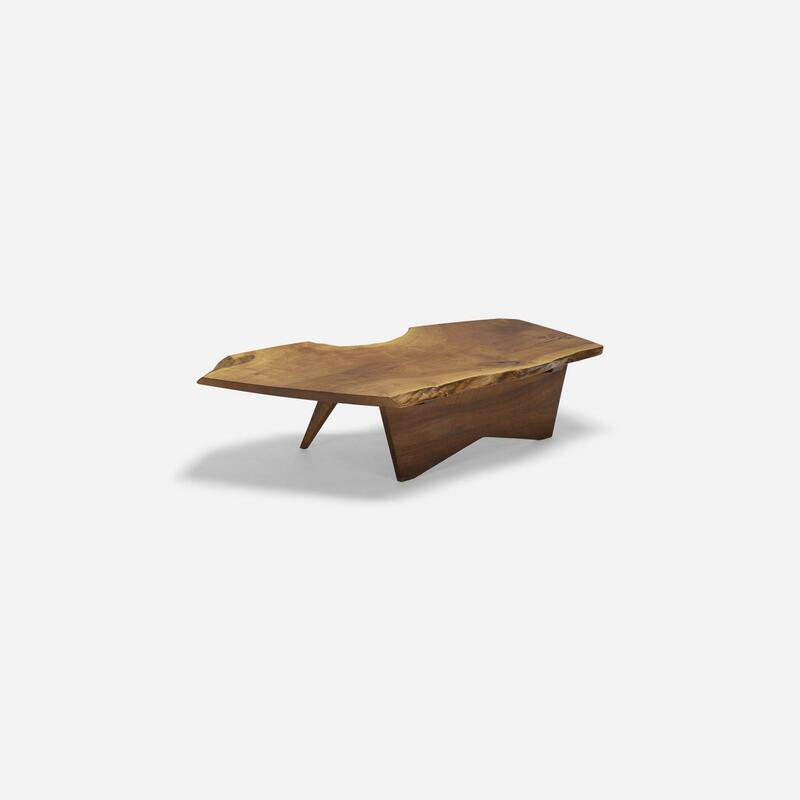 Many still can’t believe how a coffee table with rough edges was sold for 30% more than its estimated price. 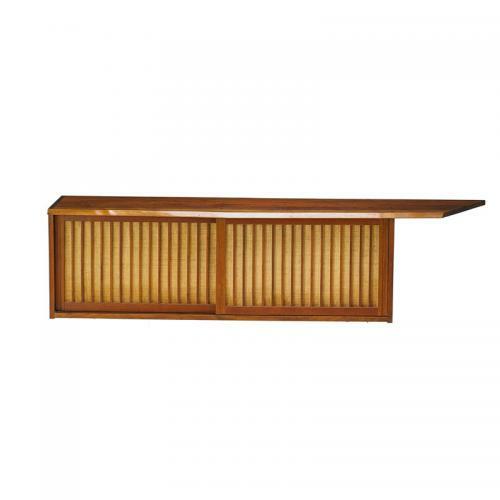 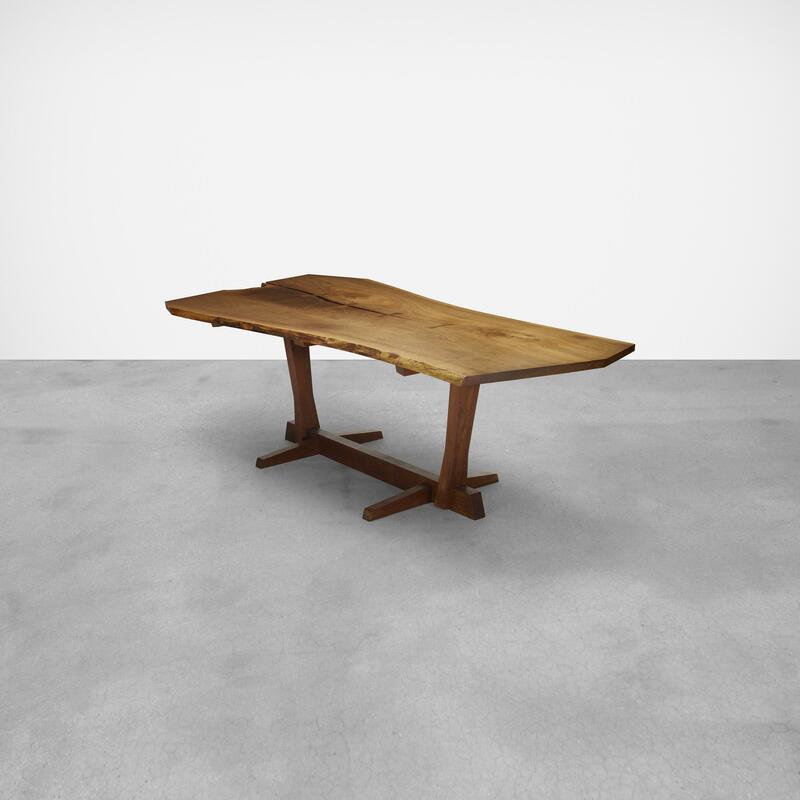 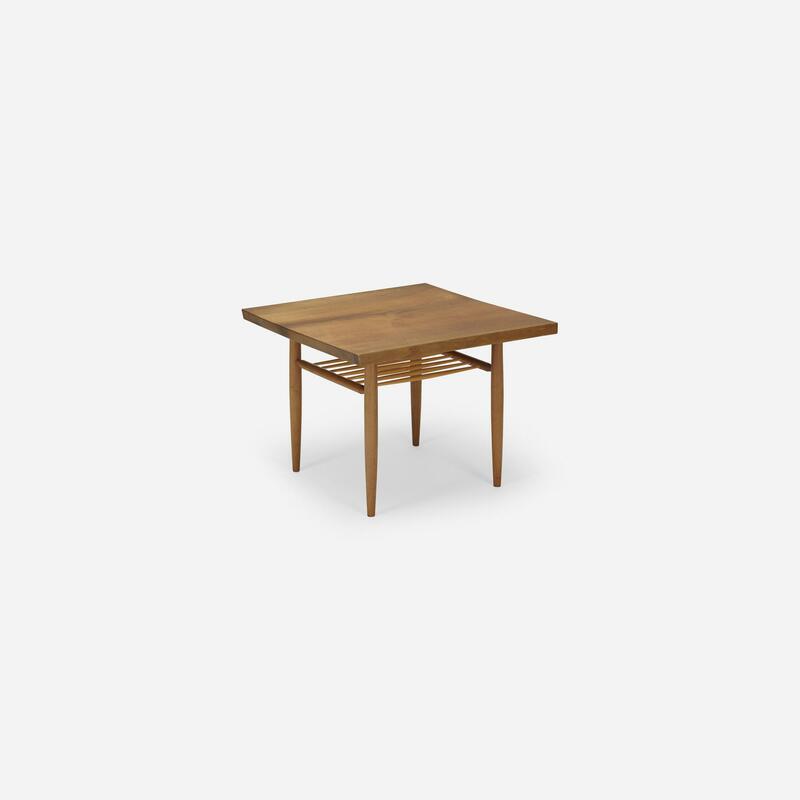 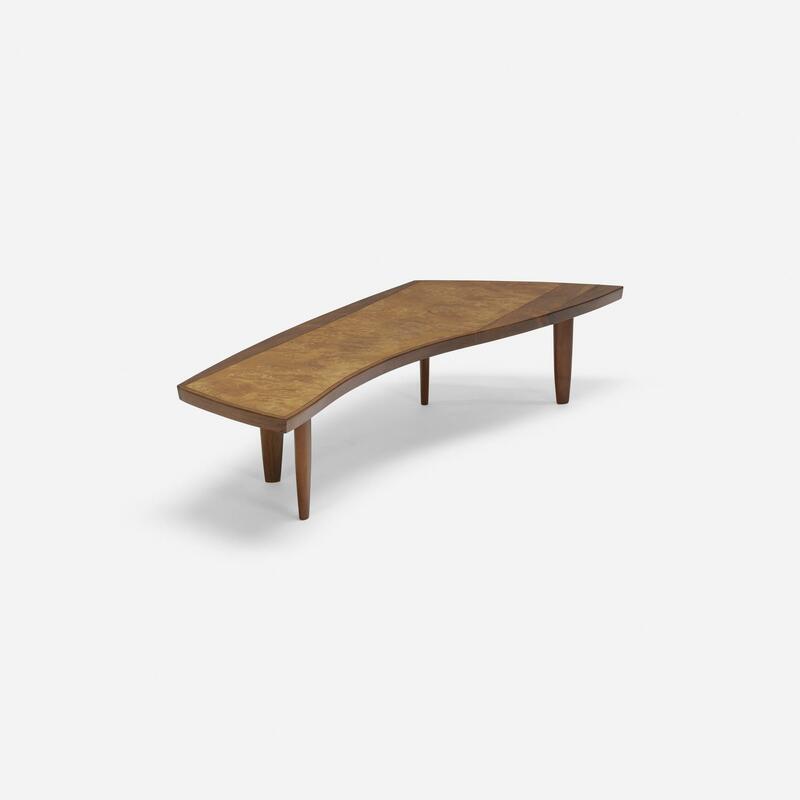 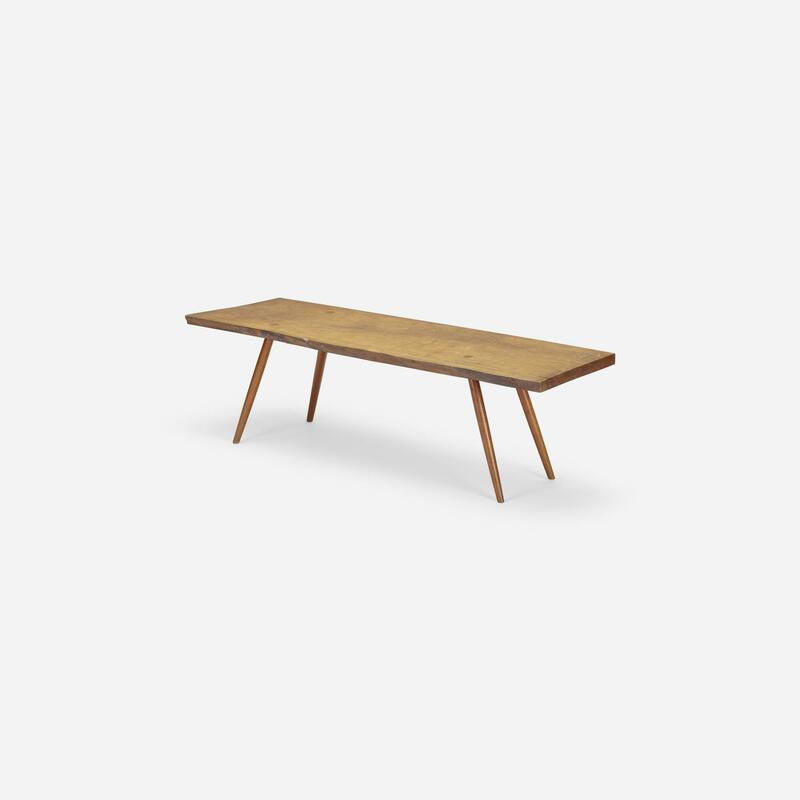 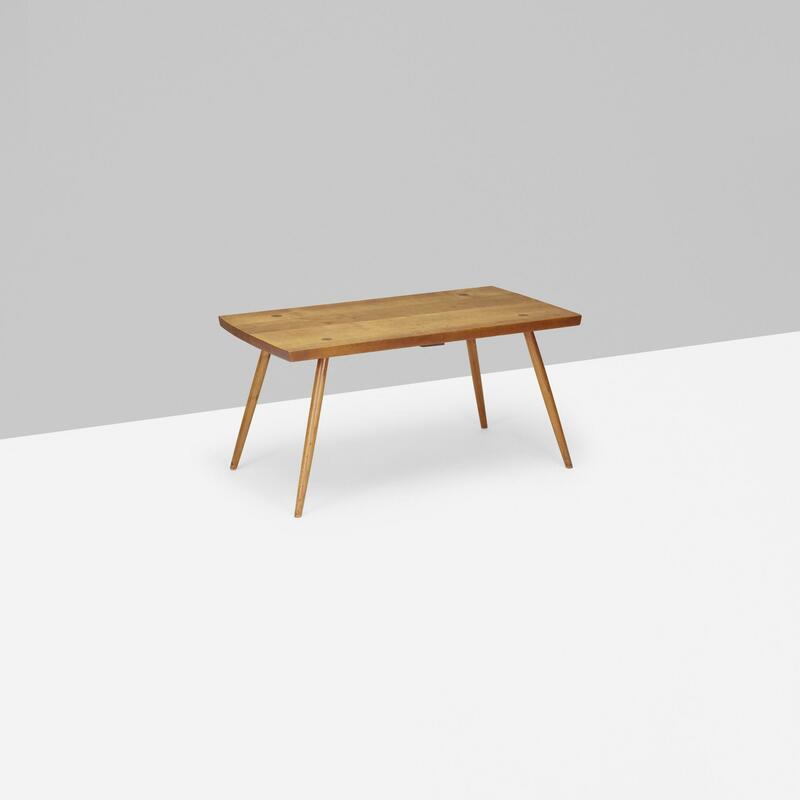 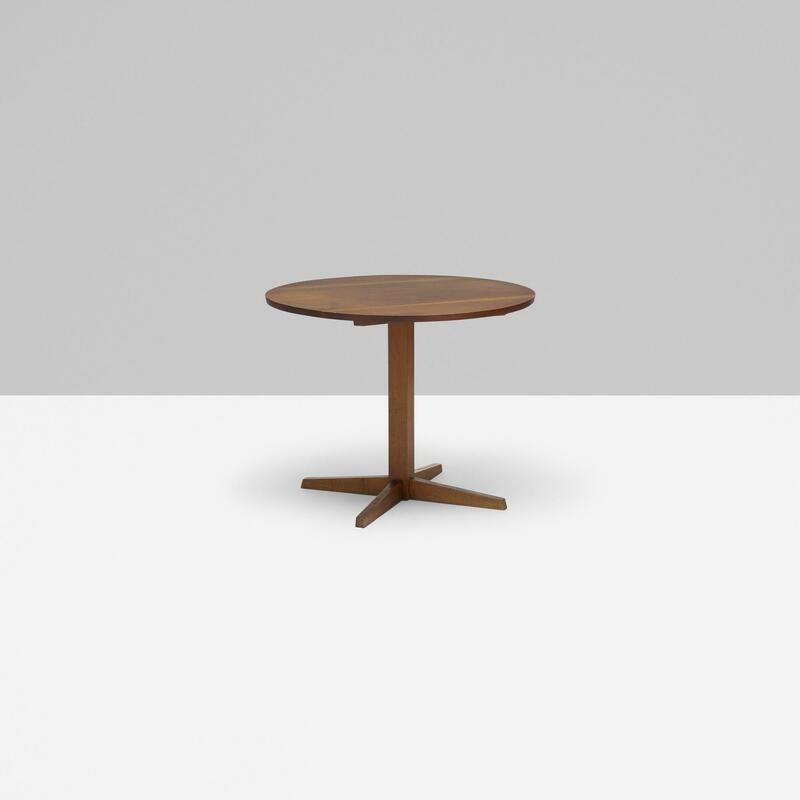 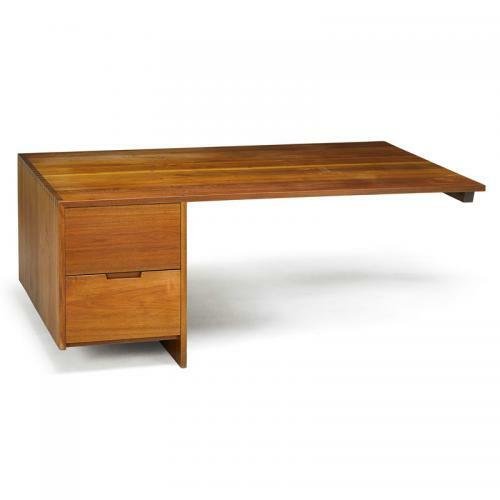 The Table Basse, which Nakashima built between 1950 and 1960, was sold for 97,000 euros or about $112,000. 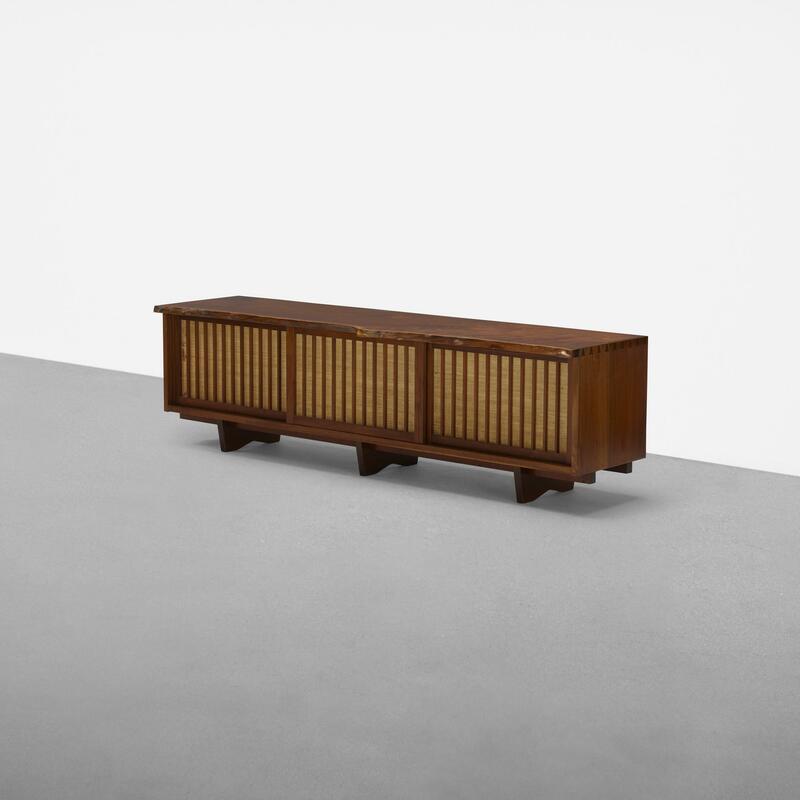 Auctioneers estimated its worth to be around 40,000 and 60,000 euros. 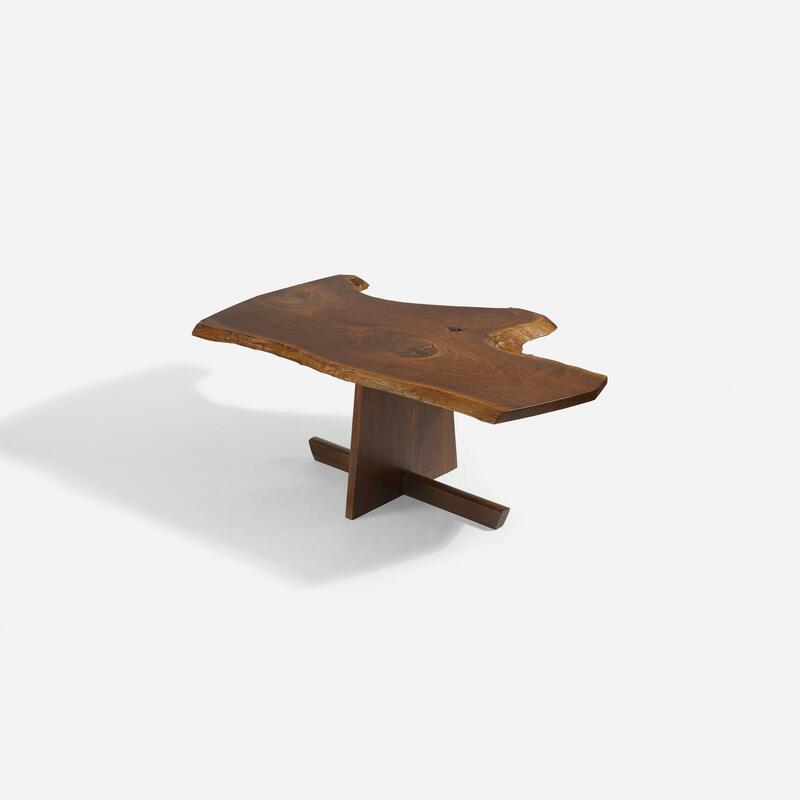 But then, Nakashima’s imperfect intricacies are exactly what he is known for. 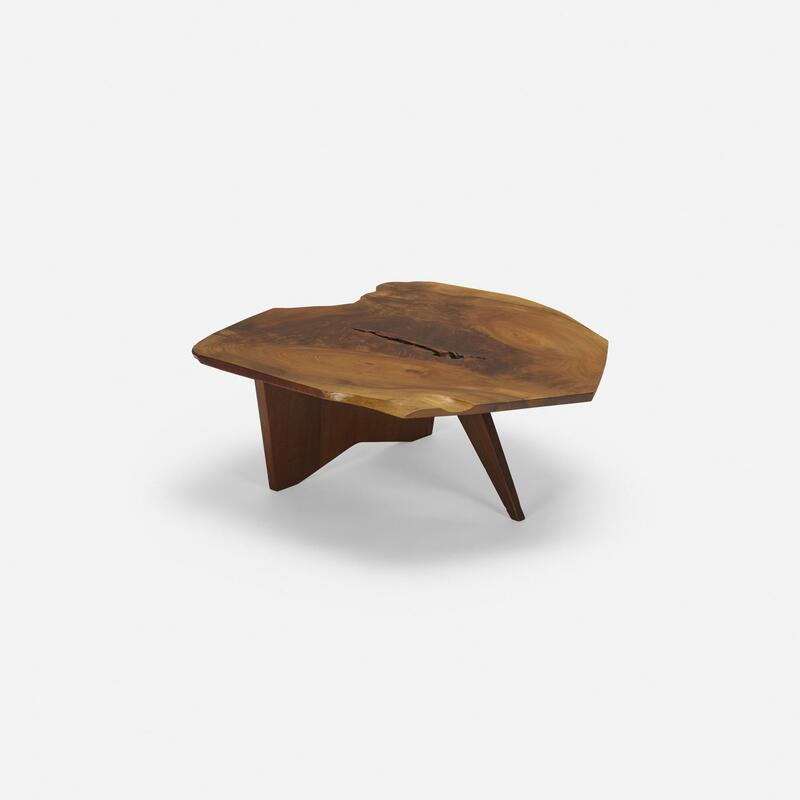 He would take all the wood that other furniture makers would discard and use it to build interesting coffee tables. 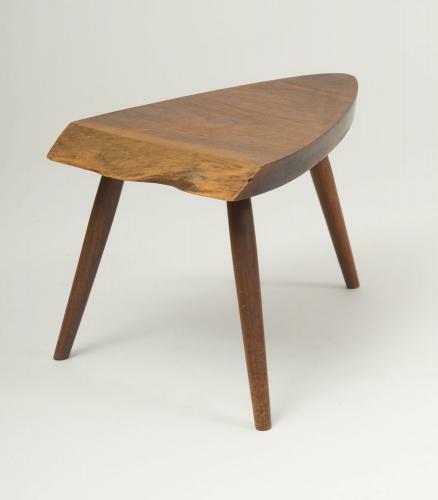 He would make the top smooth but leave the outer edges rugged, creating a very distinctive appeal.